I am a fan of words and pictures; I don't like graphic novels. They make the two parts of my brain, the picture part and the word part, confused. I can look at the pictures or read the story. When I read a story I want to create my own pictures and be transported to another world. There is a class of graphic book that I like very much: non-fiction that deals with complex or difficult topics. This is where it helps to keep a certain distance. The Holocaust and the Iran of the Islamic Revolution are not places I want to imagine myself. Maus and Persepolis show me those worlds. Ellen Forney's new book is planted firmly in this territory. Because of my family history of mental illness, I appreciate the little step back. A funny book about bipolar disorder? But still informative? 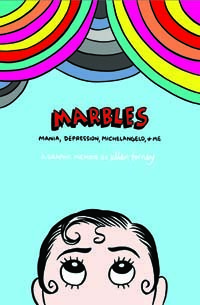 Marbles does what this genre does best: takes a difficult subject and makes it accessible. The pictures convey manic and depressive states with a visual richness that amplifies the words. Forney traces her life after a diagnosis of bipolar disorder. She becomes a member of Club Van Gogh - proof that she is a real artist because artists are crazy, right? Her research shows that the science supports the stereotype. Artists are more likely to have mood and psychiatric disorders. She likes some parts of her manic states but not the pain and paralysis of depression. Terrified of losing her creativity to the numbing of lithium, she works with her psychiatrist to find the right combination of medications. Using her art to explore her own situation and the cultural stereotype of the tortured artists, Forney discovers it is possible to be balanced and creative and write a funny book about a serious subject.